Are you one of those people that go through life, day by day, year by year never wondering about what you truly are? The nature of you, of existence? If you are then you have something in common with nearly everyone I have ever met! Happy that way? If you are then I suggest you do not read my book, because if you do, then all that will soon become thing of the past! 5.0 out of 5 starsA brilliant read! I love a story that makes me think. Adriana by Mark Angelo Lusardi does exactly that. It is an amazingly unique, well written book. This science fiction story is sometimes gritty and sometimes beautiful. 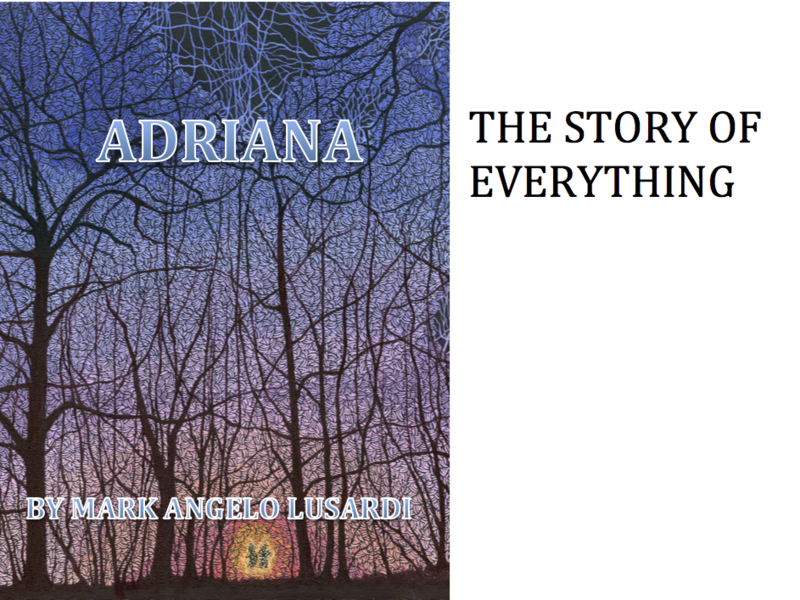 Adriana is an enigmatic character from the beginning and as the story progresses it is implied by Mark Lusardi’s well researched detail that she may be a savant. She is befriended by five people and centred on Adriana, events are experienced that explore the nature of the human condition, and our place within the Grand Scheme of things. Added to that the twist at the very end of the story is a real gem. This is a read that expands the mind, the sort of book that one finds difficult to put down. I will keep it on the shelf to read again. Well done Mark Angelo Lusardi, you deserve Adriana to go far . . . into film would be great! I bought this book on a whim, I liked the cover. It's turned out to be an intriguing story which I had to keep reading. It was the characters which really held my interest. I found myself so curious about what was going to happen to them that I read the whole thing in a couple of days! It's totally unpredictable, mad and shocking but a really satisfying read. I don't like the usual predictable, formulaic stories which are so prevalent these days. I also like a good, well thought out ending to a sci-if story which is quite often, sadly lacking. Adriana is none of these. It is well written, thought provoking and a whirlwind of a story. The author obviously has a good scientific knowledge which weaves its way through a fascinating, original plot. Adriana is a lovely character who completely captures your heart, and wow, what an end - I didn't see that coming!